On this day of 26th January, India prepares to celebrate its first national holiday for the year 2016; the 67th Republic day. The day is very special to the country for it’s a commemoration of when it officially became a republic after having gained independence on the 15th of August 1957. This highly anticipated celebration is reportedly regarded to be even more special compared to the previous years, due to some special events. Other than the chief guest being the French President Hollande, the Indian government is expected to initiate the “Stand Up India”, a program expected to open up numerous job opportunities for the youths across the country, among other special events. Wireless Integrated Public Address (WIPA) system has already been setup in 13 metro stations and 31 crowded places in Delhi. Several roads have also been blocked due to the ongoing parade practices. Moreover, tri-color decorations have been put at public places just to mention a few. • French troops would be participating in the parade. • The Navy tableaux will display the aircraft carrier Submarine Kalvari and Vikrant as the countries first indigenous developed aircraft. • Unlike previous years, a BSF camel contingent won’t be seen marching down at the Rajpath. • Paramilitary forces like SSB, CISF and ITBP would be absent this year from the parade. • The army dog will make an appearance after 26 years of absence. • A women only stunt contingent would demonstrate motor cycle riding skills for their first time. For this and more on the celebrations, anyone including the NRI wishing to watch them live can tune in on the Times now live and India Today news live channels for more updates. 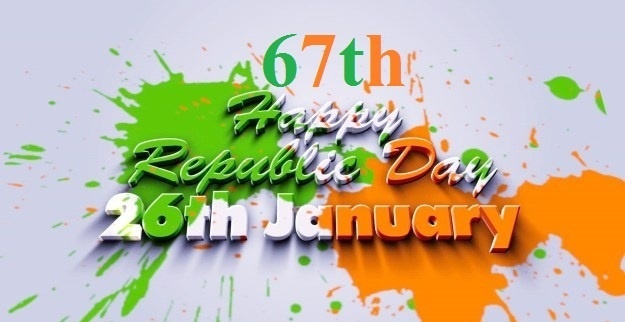 And finally, YuppTV wishes all viewers a happy and memorable 67th Republic day. Let us all remember the golden heritage that characterizes our nation and feel proud to be a part of India!